This 400+ pages book is clearly a labor of love created by one who has been there and done that! Larry takes us through a whirlwind tour of the 50’s, 60’s, 70’s, and 80’s while maintaining his evolutionary heading. Human evolution for Larry always contains a strong dose of fun. As a reader (also having ‘been there’) I continued to be amazed by the brevity with which Larry paints entire landscapes and reveals in-depth human experiences of the most sublime realms imaginable. Highly recommended for any seeker of truth or for any historian wishing to capture very significant cultural milestones of these four decades. I absolutely love the book! I like your writing style, Larry. You have me laughing out loud. You really captured not only your own experience, but an interesting, and huge, transition period. I hope the book does really well. I have already mentioned it to friends who I think would enjoy it. Now I know more about you than perhaps anyone ever should. Probably the smartest move you ever made was to fall in love and tie Linnea down. Your book has cast somewhat of a doubt on Linnea’s good judgment. I had always considered her to be one of the smartest cookies around, but many cookies do harbor nuts. Of course, I have to admit that you must have good genes, either that or Linnea’s overrode yours. You couldn’t have made a better prodigy than Devan. And, Devan’s good sense has helped him wed Sarah. So, all in all, you have done well for yourself, and therefore it really makes me question Darwin even more so than I might have in the past. The part about romantic moments with mom in the book is kind of gross. Larry Wardwell is no slouch when it comes to exploring what the many worlds have to offer! As a young man in the 1950s and 60s, his zany and often funny experiences (the first third of the book) can be a little confusing as far as where this is going–but be patient! Once he meets the love of his life in his early 20s and goes to Ram Dass and Timothy Leary’s commune for some psychedelic mind expansion, the adventure develops a strong direction and focus. He and his wife delve into the TM movement and become teachers and facilitators. They drop out of conventional America and travel the continent living frugally and close to the earth, encountering colorful characters and situations at every turn. Larry’s interactions with his guru, Maharishi, and his vivid and powerful descriptions of experiences during meditation are some of the most intriguing I have ever heard. He and his wife made choices to create a life rich with beauty, variety, and happiness–on a shoestring. If you’re interested in alternative lifestyles or spiritual journeys, this is the book for you! I started reading the first chapter about “Bob” and the Cape and your graduation. Tears were rolling down my cheeks I was laughing so hard. Great stuff. I can’t wait to get to the Air Force and Texas! Confessions is the author’s truly amazing story of growing up traditionally, but rather wildly, in post WW2 America, working in the U.S. military and intelligence community and ultimately finding a more meaningful life of higher consciousness in meditation and yoga. Larry’s experiences along the way range from shear delight to absolutely scary. The reader may come away with feeling his or her life has been rather pedestrian but may be inspired to make some changes. Don’t miss this exciting journey and get inspired! What a pleasure to read the story of friend whom I thought I knew well, only to discover that there was a lot I didn\’t know at all. It was a delightful discovery. Larry Wardwell’s book Confessions of a Closet Yogi is the intriguing story of a lifelong search for the way to live. The journey begins in a meandering way, but focuses more and more as the years pass and Larry and Linnea discover more about themselves. The tenacity of that search keeps the reader interested. And so does the humor. Of the many memoirs I have read recently, this one really held my attention. Imagine my astonishment to learn that Larry Wardwell wrote a book. Then I read it and enjoyed it! It is very readable, thoughtful, thought-provoking, and even a page-turner. 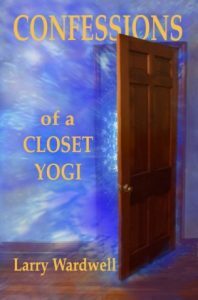 Confessions of a Closet Yogi strikes just the right balance; down to earth with touches of Larry’s wicked humor. It is accurate from everything I know about Linnea and Larry, incredible couple that they are. I enjoyed both reading about the many places I visited them and learning more about what they were doing in between (amazed at how many different places they lived, meditated, studied and taught! ), and of course about Larry’s life before I knew him. I have always been so impressed with their partnership and the path they have traveled together, even more so after reading this book. When we all lived in California, I drove my hippie van to Willets many times to visit them on weekends and was always welcomed with open arms. I became interested in meditation through them, and was initiated at SIMS in Berkeley. I can go on and on, but let me just say: read the book. Really enjoying “Confessions”. I’m on chapter 7. I would have gotten farther if the holidays and work hadn’t gotten in the way! So each night before retiring I sneak a few pages in and end up staying up much too late! Darn that Larry! We just finished “the book” a couple of nights ago. Robert read a few pages to me each night before bed so the two of you have been our constant companion. We laughed out loud…. often at Larry’s capers and his vivid descriptions of the vicissitudes of life in an organization be it army, government or meditation movement. His deep love for you is evident and made it as much a love story as an autobiography. I received Larry’s book….wow he freakin’ knew Timothy Leary!!! I’m only to the first chapter but am enjoying it, actually has made me laugh out loud!!! Larry, I have been remiss in writing to say I finished your book in 2 days, could not put it down, and loved learning how rich and powerful your life story is. You have always had my admiration. Now you have my unbounded respect and compassion for choosing love and adventure at every turn. Wonderfully written, too. Thank you! Send us your review here! Thank you!